Huzzah! I’m glad I am! And it’s not suffering actually, I’m just super keen to be writing! You’re going to Portland!!!! As in Portland Oregon!!!! I have family there!!!!!!! Why am I here? I already read this comic. Why am I here? OH…. it’s called PROCRASTINATION!!! 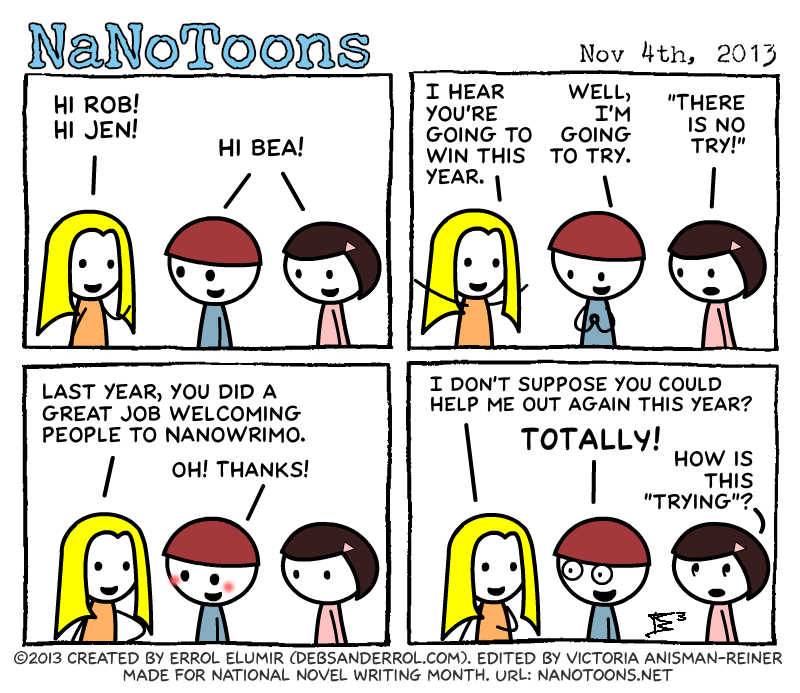 I hope that Rob wins NaNo for once. I AGREE!!!! Please may he win this year! I only had a half an hour to type today. 😦 I’m kinda sad because I’m behind in word count. I thought that I wasn’t going to make my word count for today because I procrastinated like a champion, but then I remembered the NaNo Word Sprints on Twitter and I went over my count! Yay! So maybe Rob should do word sprints, since they’re not as competitive as word wards.